Gov. Cuomo's office is being questioned by the FBI about its hiring practices. A spokesman for Cuomo called the investigation "absurd." Jonathan Dienst reports. 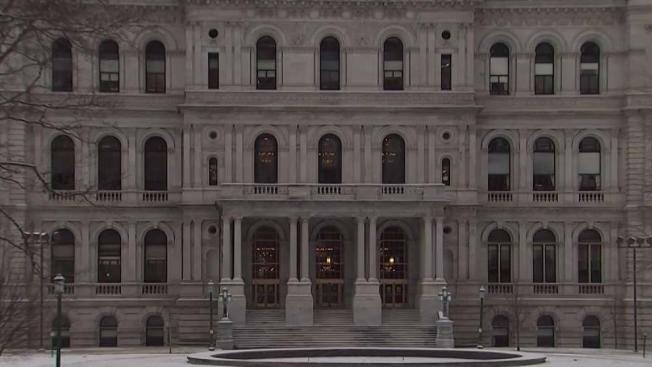 The governor's office pushed back hard, calling the FBI investigation "absurd"
Investigators are looking into whether dozens of state workers hired on paper to fill specific jobs at various state agencies were instead tasked to work directly for the Democratic governor. The governor’s spokesman said this is a mere head count and placement issue. But the feds want to know if there is any wrongdoing in using money meant for agencies like transportation or children’s services when in reality those workers may be serving as political appointees to the governor. The Albany Times Union first reported many of these workers are former Hillary Clinton campaign staffers and other Democratic operatives hired as Cuomo may be exploring a possible presidential run. FBI spokespeople in Albany and Washington declined comment as did a spokesman for the U.S. Attorney’s office in Brooklyn, which apparently is helping lead the inquiry. Cuomo’s office said the subpoena was received months ago. The state GOP issued a statement saying Cuomo is abusing taxpayer dollars to fund his presidential ambitions. Cuomo spokesman said former Gov. George Pataki, a Republican, hired 40 staffers this way and said it is not unusual for governors to use creative ways to hold onto staff. This investigation is separate from the so-called “Buffalo billions” case and the bribery charges involving one-time Cuomo aide Joe Percoco. No criminal charges have been filed in connection with this investigation focusing on staffing in the Executive Chamber.